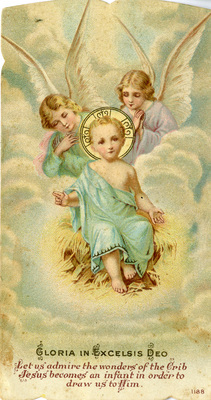 "Baby Jesus and angels holy card"
The baby Jesus is pictured seated on a bed of hay surrounded by clouds. Two angels are adoring him. This card was printed by an unknown publisher at an unknown date, probably in the early twentieth century. The back of the card is blank. Gloria in Excelsis Deo. Let us admire the wonders of the Crib Jesus becomes an infant in order to draw us to Him.